Hi guys! Just sharing my projects made with the new Paper Smooches December release! This first card uses stamps from the Love Struck set. I used the curved die from the Borders 1 die set to create a reverse cut glitter whoosh (you like that description? lol). (Just a tip, this is also a great way to make a spinner card, but this one isn't one;) And thank goodness for matching dies! It was a cinch to cut out Cupid! If you're wondering, the dies are open dies which means you can stamp first and then die cut (which I much prefer to the other way around!). And these dies have the perfect amount of white space around the image. I'm picky, I know! Thank you so much for visiting today! Betsy Veldman is sharing some of her Paper Smooches projects today too and knowing her, I'm sure they are amazing! LOVE what you've done with the fun Paper Smooches goodies! Love all your colorful cards. I especially like the gift packaging for Cooper. I'm surprised he does not sit by the table and bark for his present. I know our dog would have done that. She always knew which were her presents. You ROCK, JJ...I mean, you seriously ROCK!!! By the way ~ I'm glad you're picky...it makes your cards and projects so special ~ Every, Single Time!!! Thanks so much for sharing your projects with us! Love them all, JJ! That glittery whoosh of love is just perfect! What a neat idea to show movement. LOVE IT! I cracked up reading your description of the gift for your pooch because the first thing I thought when I saw it was that it better not go under the tree unless you have an insanely angelic dog. 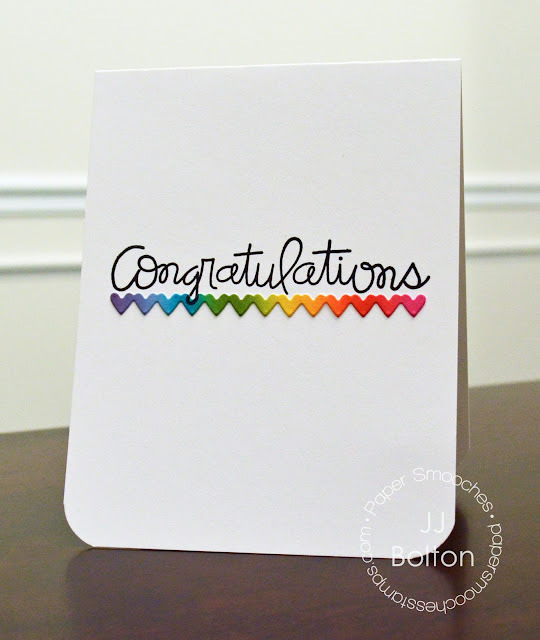 ;) The congrats card is all you in your simple CAS amazingness. Love LOVE!